So just how big a project is rebuilding the Calgary Flames? Countless articles and endless minutes of media coverage in Canada over the holidays talked about how Darryl Sutter left this team without the young or tradeable assets necessary to build hope for a better future. The bar is being set incredibly low for Jay Feaster. Basically, if he makes a couple of trades for draft picks at the deadline, columnists will award him a Bronze Star for valour. The thing is, the Flames situation is desperate only if you believe they should be competitive right now. In short, if you drank from the Sutter kool-aid, you’re a very unhappy person right now. Yet most Flames fans stopped drinking this Kool-Aid long ago. Similar to up the road in Edmonton, Flames fans are just hungry for a period of sustained success. They are tired of mediocrity. And mediocrity is all that Darryl Sutter has been able to muster since the lockout. Which is why it was most alarming to hear Jay Feaster say in his first press conference how the playoffs were a goal for the team. Perhaps it was an empty promise. However, the post-lockout NHL has proven itself to be an incredibly difficult place to remain competitive and rebuild at the same time. These days, the best talent is locked in contract-wise, which means there aren’t the same rebuilding options as there used to be on the UFA market each summer. Similarily, good young talent is also the cheapest, and therefore greatest, asset a team can have in the NHL. So you see less of it on the trade market. Finally, with the league’s salary cap structure, and most teams either maxed out or at their own internal budget, you just don’t see big contracts moved very often. The Toronto Maple Leafs are one team that have tried to have it both ways – rebuild and remain competitive. And while they’ve been successful acquiring a few strong young pieces (Phaneuf, Kessel in particular), their efforts have neither been good enough to turn the franchise into a playoff team, nor bad enough to give the team a collection of top-end draft picks. It’s a tweener franchise, and looks like it could be that way for years to come. No, if you have a strong front office (and let’s not forget Jay Feaster’s won a Cup already), the best way to build a Cup contender in the post-lockout NHL is to, basically, tank it for a couple of years. It let’s you accumulate assets, cap space and build hope amongst the fan base. 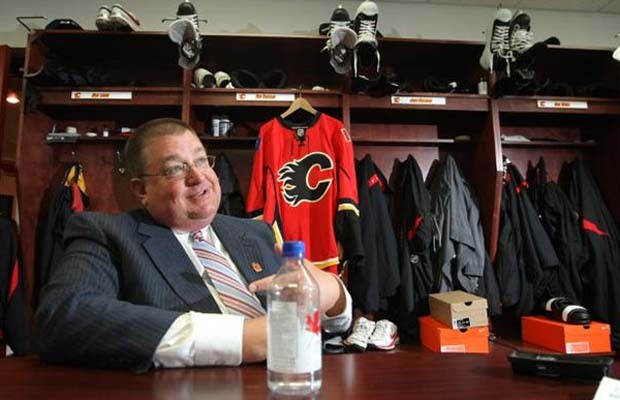 The best thing Jay Feaster and the Calgary Flames can do is copy a move from Toronto Blue Jays’ GM Alex Anthopoulos – communicate that 2013-14 is the year you plan to be ready for a Cup run, and build everything the organization does towards that goal. For whatever reason, whether it’s Gord Miller going crazy over goals against Norway, or Pierre Maguire’s usual blind homerism, or the fact that Canada has dominated the tournament for so long, the TSN broadcast of the World Juniors this year seems rather smug and self-congratulatory. Then again, there are a lot of folks who’d say that’s TSN’s approach in a nutshell. One wish for the Flames rebuild: bring back the puck pursuit, offensive hockey the team was known for in its glory years. One team that’s always pointed to as a team that’s “rebuilt” and stayed competitive is the Detroit Red Wings. Well, no team has scouted Europe better, particularly from 1989-2000. Remember, even in the early 1990s there were NHL teams that weren’t interested in drafting Europeans. However, since the hey-day of drafting players like Zetterberg, Datsyuk and Franzen, it’s been a long time since the Red Wings hit the bulls-eye at the draft. Jonathan Ericsson was supposed to be that player, and he just hasn’t performed up to expectations. The Red Wings are the oldest team in the NHL this season, and have been one of the older teams for years now. It’s hard to believe sure, but the sun has started to set on this dynasty. Remember Jason Smith, the former Oilers captain? If you look closely enough, there’s a lot of Jason Smith in Theo Peckham’s evolving game. Daniel Winnick and Ian Laperriere look like twins. One more Calgary note, it would make sense for Pierre Gauthier to at least kick the tires on bringing Jarome Iginla to Montreal. He’s exactly what that team is missing in a lot of ways, and has played enough defensive-first hockey to fit well into Jacques Martin’s system. Puzzling way to treat Nazem Kadri by the Toronto Maple Leafs and Ron Wilson. Bench him for three games. Tell him he added too much muscle in the off-season and has lost a step. Then, send him down to the AHL and, while the door hits him on the way out, hold a media scrum where you mention he needs to get stronger. The best place for Kadri is definitely in the AHL – at least it gets him away from the mixed-messages of Ron Wilson. So Bryan Murray this week complains that there are two-tiers of justice in the NHL. How is this news to an NHL GM? Since Derek Roy’s injury effectively kills the Sabres chances this year of making the playoffs, does this mean we’re watching Lindy Ruff coach out the string? Or does the injury buy him another season? Speaking of injuries, the Oilers’ loss of Ryan Whitney assures that team of a top-5 draft pick at the very least. He was enjoying a breakout, All-Star calibre season before his ankle injury. The development of Logan Couture probably means another disappointing playoff performance could make one of Patrick Marleau, Joe Thornton or Joe Pavelski available. Michael Farber has five theories on what’s wrong with Alex Ovechkin. Here’s another – that OV has always played on instinct – from the heart, not the head. When other teams figured out how to defend against him, it’s forced him to think and analyze – to go against his instincts – which has slowed his explosiveness right down.